The thing is, for more than two decades, Danbert followed a fairly straight path—albeit a nontraditional one—as a vocalist with the British anarcho/punk band Chumbawamba. It’s really only since the group dispersed—and Danbert found himself moving from gritty Leeds, England, to Twisp—that his activities broadened to accommodate the farther reaches of his imagination. 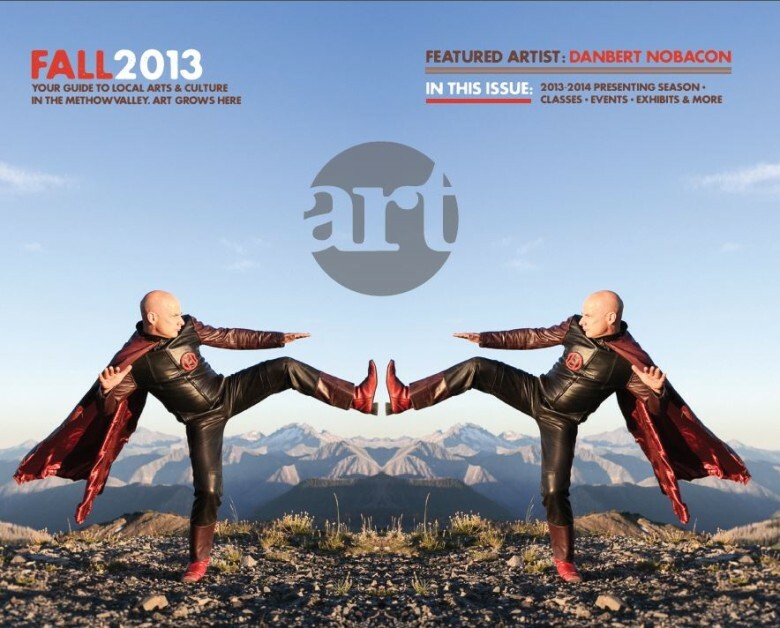 Danbert says his six years in the Methow have essentially been a post-graduate degree in performance arts. “I was in a band for 22 years—that’s pretty much what I did,” he said. But since landing in the Methow, he has acted on stage and in film, choreographed and appeared in several dance productions, written a book and regular essays for a blog, developed and hosted a radio show with its own cast of characters, designed and modeled clothing from recycled materials, and taught songwriting and street theatre. Danbert seeks to impart that enthusiasm for experimentation when teaching young people. Although children naturally make up melodies, Danbert says expression through music is often not encouraged the way visual art is. So he teaches songwriting the way others approach painting—as a way of creating, using sounds as the palette. Danbert’s faith in this process comes out of his own experience. “Punk rock saved my life—it opened up a whole new world in my teenage imagination,” he said. The edgy music and its openness to political and social critique revealed a world that wasn’t restricted only to those with extensive training. “It was a cultural shift—it just ignited me,” he said. Reassured that it didn’t matter whether you could play an instrument—or more than three chords—Danbert and some friends in Leeds started a band. After several years of performing on street corners and actively promoting their music the old-fashioned way, through radio and distribution of cassette tapes, Chumbawamba took off, ultimately scoring an international hit with “Tubthumping” (“I get knocked down, but I get up again / You never gonna keep me down”). Danbert grew up in a small industrial city north of Manchester, England, in the 1960s and ’70s, where he remembers scant opportunity to participate in music and dance. Although the formal artistic opportunities were limited, Danbert inherited a gift for performance. His great-grandparents were itinerant entertainers who toured Great Britain, a specialty rendered extinct by radio and TV. Even the tradition of singing around the piano had disappeared in England after World War II, he said. Danbert’s mother played piano in church and his father sang with an a cappella barbershop group, but they did not have a piano or other instruments at home. Danbert wants to help kids feel confident to follow their imagination. The street-theatre camp he led last year embraced his fundamental approach to art: “We can do this—there’s no rules that say we can’t.” The invented props, banners, and songs, and took their skits around the valley. In addition to teaching others about theatre, Danbert has acted in several community theatre productions and in two local movies. In the theatre, he has had to learn to reign in his impulse to improvise, and on film, to tone down his delivery, because everything is magnified. “I have no idea if I’m any good as a film actor, since the films haven’t come out yet,” he said. He became involved in dance after being asked to compose music for a dance troupe, which evolved into joining the dancers and ultimately choreographing his own piece. Danbert still keeps up with music, touring solo and with the Seattle band The Bad Things. He plays rhythm guitar with an informal group in the Methow. Danbert is also writing fiction and social commentary. Following an invitation from a friend, three years ago he wrote and published 3 Dead Princes, an anarchist fairytale for young adults—a concept he acknowledges is “a contradiction in terms.” The book’s language is so inventive, with terms like adamonkey, pretendsuppose, and swaggerswanking, that the book includes a glossary. Danbert hones his storytelling and character-development skills with his monthly radio show for K-Root. “Mystery Motel” includes a lot of improvisation, with Danbert taking on the personas for a cast of regular characters. He has also been writing essays – about one a month – for a New York–based website called The Weeklings, where he expounds on politics and current events and muses on life in the Cascade foothills. His most recent essay describes creatures large and small, from a bear sighting on the Loup that even briefly diverted his teenage twins from an argument over an iPad, to black widow spiders (“I have learned to catch them with a jar and a postcard on top and then release them somewhere at the other side of the river,” he explained). Danbert has always felt a connection to the mountains. In England he competed in fell (hill) running, which involves long races with serious ascents and descents. In fact, he was the British fell running champion in 1989. Even on the rock-concert circuit, Danbert used his mornings after a gig to explore a city by running—say, to a glacier outside Innsbruck—and would still make it back for the afternoon sound check. “It’s so counterintuitive. I would never have imagined it—that I’d do more varied creative things here than in a big city,” he said. Danbert can be heard on KTRT (97.5 FM) on the first Thursday of the month from 7 to 9 p.m. He can be read on www.theweeklings.com/author/dnobacon. His own website, with links to various projects and interests, is www.danbertnobacon.com.